Source Code Pro is a very nice font but the lack of italic variant makes it unusable (out of the box) in any of JetBrains products. Copy Source Code Pro’s ttf fonts to folder /Library/Java/Home/lib/fonts (OS X Mavericks) according to this comment on GitHub. It works fine for me. 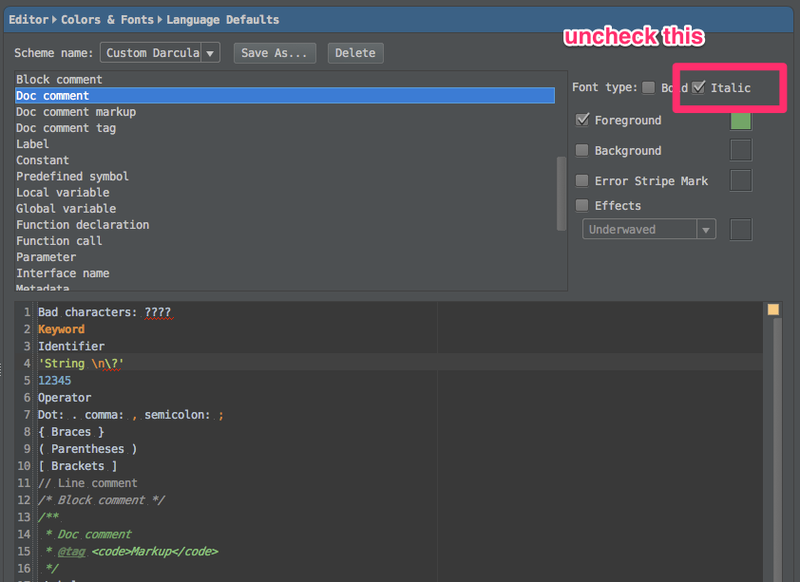 Apparently, by doing this, IntelliJ will pick the regular variant and use it where italic is needed. So it’s kinda of the same as the method below 1. Use a fall-back font that that has italic variant and looks similar to your font of choice . But if that’s the case, why not just use the fall-back font as the primary one. Don’t use italic font 1. Pray and wait for someone to submit a pull request of italic variant. I myself went with option 3 and decided to stick with Panic Sans in IntelliJ IDEA (and Source Code Pro everywhere else) for the time being.